I’ve loved historical fiction for as long as I can remember, I would definitely count it as one of my favourite genres. So I jumped at the chance to read and review this book, which is set in one of my favourite periods of history and described as perfect for fans of CJ Sansom- which I am definitely a big fan!! Enough rambling, lets get started; and make sure to check down the bottom for an exciting chance to win a copy of this book… Set in Summer of 1572, HRH Queen Elizabeth I is in danger on her throne. They’ve just sorted the latest attempt to free Mary Queen of Scots, but another plot is brewing. Christopher Radcliff, a young lawyer working from the Earl of Leicester Robert Dudley, is sent to witness the execution of the Duke of Norfolk- the Queens own cousin. France is in a bloody frenzy, with religious disagreement at the core of it; and the threat of a Spanish invasion is once again very real. 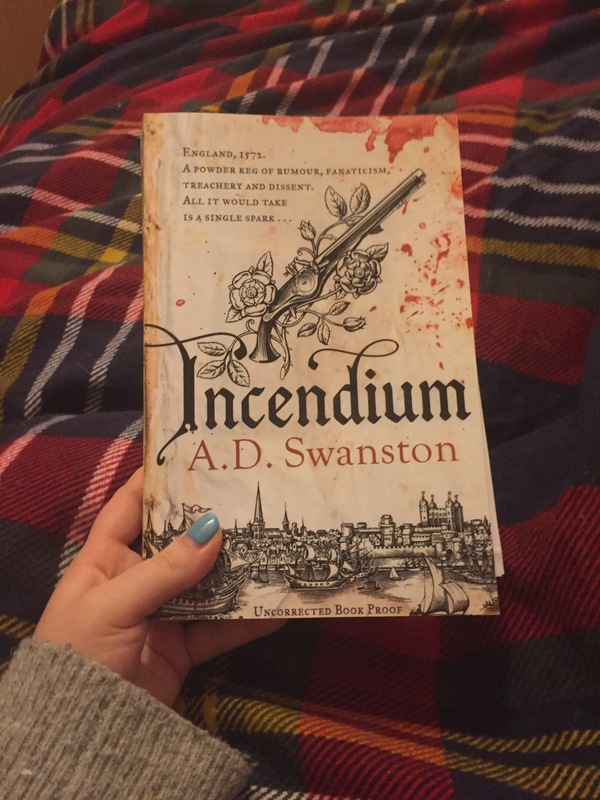 Christopher discovers the word ‘Incendium’, but has no clue as to the meaning behind it; he must work out what’s the plan behind this word and fast, before the Queens life becomes endangered. So what to say about this book? IT was muscle tensing, edge of your seat sitting, stay up all night amazing; you just had to keep reading to find out who was behind the plot and whether everyone was going to get out unscathed- even if that meant fighting against your body falling asleep. The story just seems to twist and turn continuously, you would just get an idea about where it was going and it would spin its direction; caused me to just to turn page after page in an intense urgency to get to the conclusion. I’m so excited that this is only the first in the series!! The writing was just superb, so easy to read despite fliting in and out of old English. Descriptions were vivid and perfect, knowing London, I could picture where abouts the scene was supposed to be. There was one in particular that has just stuck with me and that was the hidden passages of the church- I wont say too much so as not to spoil it, but I got an amazingly clear image in my head of how it was laid out, and still now, couple of days after finishing it, I can still hold that image in my head. I gave this novel 4.5 stars in the end as it was just fabulous, I can honestly not wait for the rest of the series- for now I’m going to have to pick up Swanston’s previous series. So now to the exciting part; I’m giving away one copy of the proof for this book along with the press release sheet! I loved this proof, its a REALLY floppy paperback- who doesn’t love a floppy paperback? Right, how to enter? Follow me on twitter (@Alexxmarie74) and then tweet me using the hashtag #IncendiumAngel . This competition ends on Thursday 2nd of March at midnight, and the winner will be announced later that date- however this is only open to UK residents, sorry!! Go enter to be in for the chance to win!! Previous Post The Killing Bay by Chris Ould &GIVEAWAY! !